Disco Cow | CowParade New Figurines | One Price Low Flat Shipping! 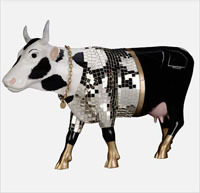 From the Retired CowParade Collection, Disco Cow. Featured at the Cow Parade New York 2000 exhibit. Made of resin & mirrors. Measures 4" x 6". 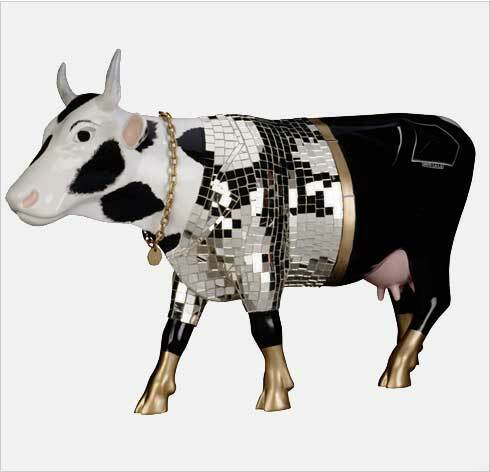 This holstein cow figurine is wearing a flashy jacket made of mirrors pieced together, and is adorned with a gold necklace and wearing black pants. Amazing detail to this hilarious bovine creation!